Construction on the new skate park in Albany's Washington Park is in progress. 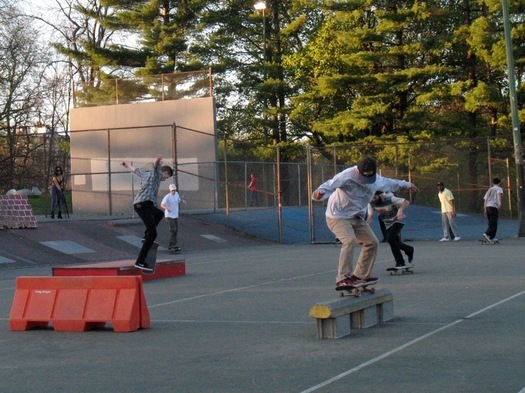 The city is aiming to have it finished by June 21 -- national Go Skateboarding Day -- according to Brian Shea, the chief of staff for mayor Kathy Sheehan. The new venue will occupy space along the Madison Ave edge of the park that was formerly rundown tennis courts. This space -- "The Blue Banks" -- had already been serving as de facto skate park. And a portion of the area that's not currently being renovated is currently serving that purpose. A rendering of the planned design. The Albany skate park project in Washington Park -- originally planned to be completed this month -- has been pushed back to next year. "The City is working diligently to bring this project to fruition by next summer," said Brian Shea -- the chief of staff for Albany mayor Kathy Sheehan -- on Tuesday. "We have established a bidding and construction schedule with an anticipated completion date that coincides with National Go Skate Day in June of 2017." A tip of the hat to J'mo and grandmastergus who flagged the delay in comments here at AOA. A closeup of the design for lower end of the park. 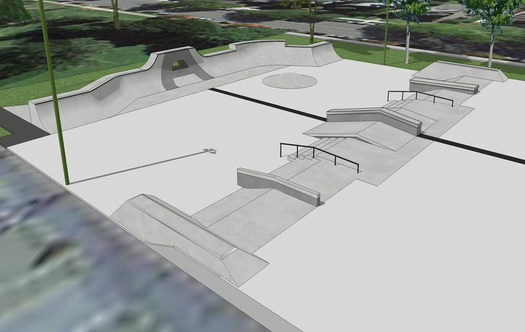 The city of Albany has posted the design for the skate park planned for Washington Park. We've clipped out the renderings for easy viewing -- they're in large format after the jump. The Skate park in Washington Park project includes the construction of a new 20,000 square foot skate park on four underutilized tennis courts located in the southwest quadrant of Washington Park. The skate park will make use of the existing tennis court surface and take advantage of the terraced construction of the courts. The surface will be complemented with a diverse range of obstacles, features, and reflect input from community residents and Albany skaters collected during the design process. The work will generally concentrate on the three lower courts allowing for a potential future phase to develop the upper court, should funding become available. The budget for the project is $200,000. About half that is coming from a state grant, another portion from the Washington Park Conservancy, and the rest from money the city has already set aside for these sorts of project. The city will soon be the construction contract up for bid, and it's aiming for a completion sometime in November. A project manager from the design firm Stantec talking with people about the design after the meeting. The long push for skate park in Albany is starting to see some progress. The design for a venue in Washington Park is scheduled to be in place by the end of this month, and construction could be in progress this fall. 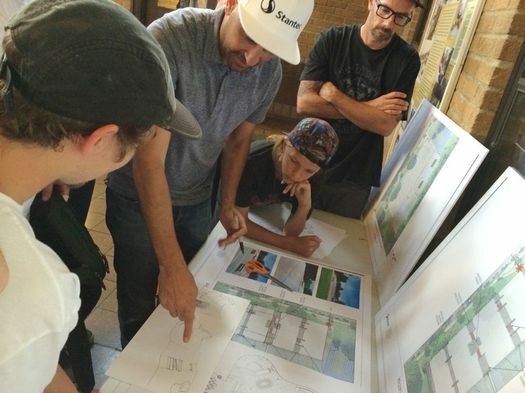 Both the bits of news are from a public meeting Wednesday night at the park's lake house to gather input local skaters about the project design. Here are a few more details. Skaters at the blue banks this past spring. There city of Albany has a meeting lined up June 15 to gather public input about the proposed skate park in Washington Park. It's at the Washington Park Lakehouse and starts at 6:30 pm. Albany Go Skate Day: The annual Go Skate Day is set for Saturday, June 18 at the Washington Park blue banks. From previous Go Skate Day in Washington Park. This Saturday is Go Skate Day in Albany's Washington Park and it could be a big day for the future of the proposed Albany skate park. "Tomorrow is an opportunity," city recreation department commissioner Jonathan Jones told us today. "Tomorrow's our shot to show the city, to show everyone, that a skate park is possible in Albany." 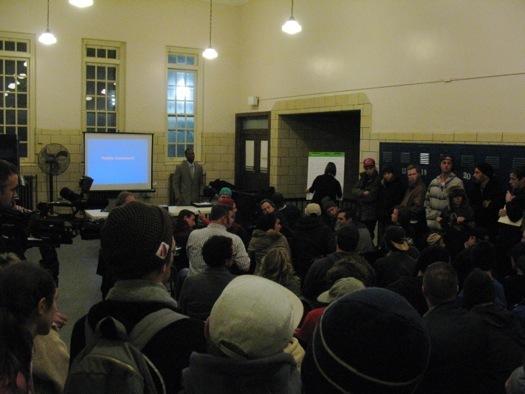 From the public meeting at Bleecker Stadium. + The current plan is to get a plan. As Albany city recreation commissioner Jonathan Jones told the crowd: "This is in the infancy stage."